Today homeowners received another dose of bad news: home values have fallen nearly 14% in just the past year in the DC metro area. 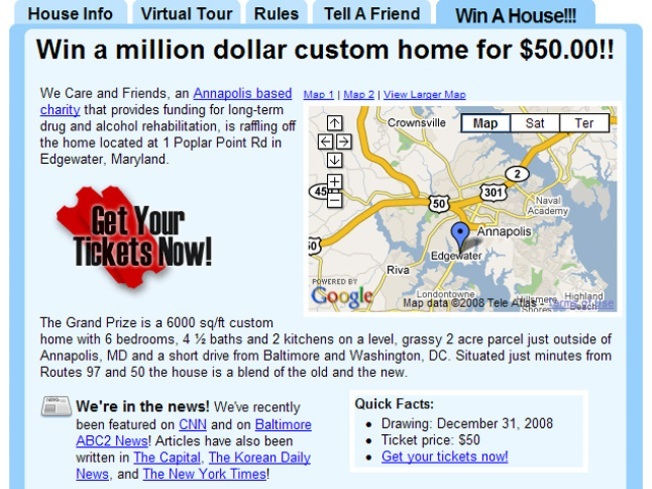 The poor housing market means there are some good deals out there for house hunters, but an Anne Arundel County homeowner says he's offering the best deal of all: $50 for a million-dollar home. Tom Walters has decided to forgo Realtors, financing, and all the headaches of finding a buyer for his 6,000-square-foot home. A virtual tour on his Web site shows the newly renovated, 6 bedroom, 4.5 bath home. After more than a year of making major improvements on the home, Walters has been hit doubly hard. He's in the mortgage business, and as his property value plummets, his paycheck is also shrinking. A family is skipping the Realtors and is raffling off their home for $50 a ticket. He says he realized it was time to get out of the expensive home as quickly as possible. That's how the idea for the raffle was born. 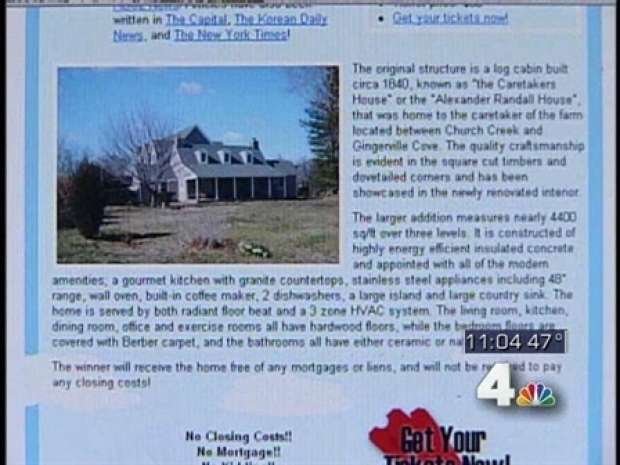 A $50 raffle ticket buys a chance at the million-dollar home. Walters has to donate a portion of the ticket sales to charity, so he calculates that he must sell 31,000 tickets by the end of the year to meet his goal. He's already more than a third of the way there, with 10,000 tickets sold. Buyers reside in nearly every state, as well as overseas. Not everyone on the block is thrilled with the idea. "Anybody could potentially own the home, whether they are financially set to be able to live in this area," Don Javier tells News 4. Realtors warn that while Walters is having some success with the raffle, it's a risky move that probably isn't the best idea for most sellers.